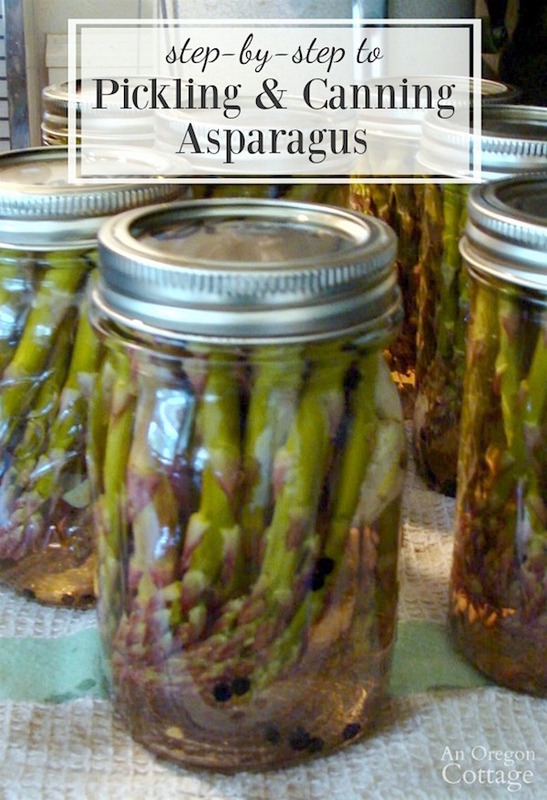 Easily make and can your own asparagus pickles to use in salads, appetizers and cheese plates with this complete picture tutorial for pickling and canning asparagus. 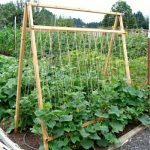 You can also store these without canning in the refrigerator for up to a year if you have the space. 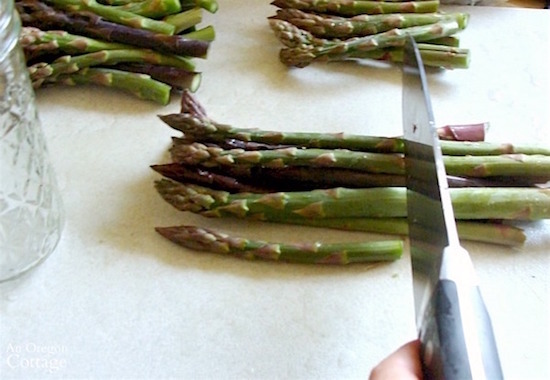 Do you have a bumper crop of asparagus or a nice farmer’s market bag full to take care of? After eating your fill of roasted asparagus (drizzle with olive oil, garlic, salt and pepper and cook in a 400 degree oven for just 10-15 minutes) or easily grilled with this amazing spice rub, what to do with the rest? Pickle it! Tangy, slightly spicy, and garlicky, pickled asparagus is wonderful right out of the jar, on salads, and makes an quick and delicious rolled appetizer using softened cream cheese, garlic and sliced meat. Yum…I literally could (and have!) made a meal out of them. 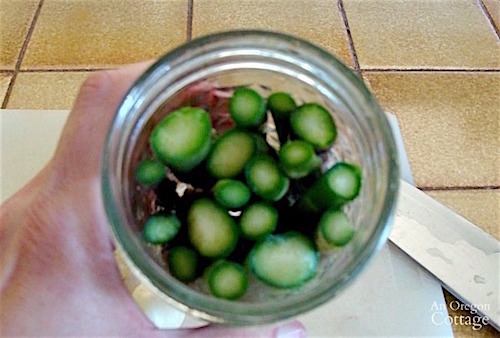 Pickling vegetables is actually really easy, either boiling-water canned so they can live on a shelf or just stored in a refrigerator for up to a year (they also stay crisper this way, like refrigerator pickles). 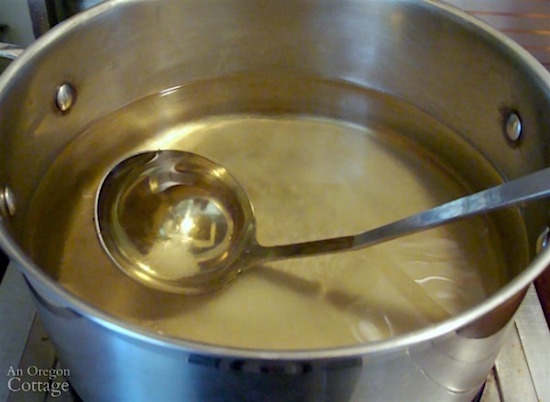 Though using a boiling water canner adds extra steps, it actually only adds a few extra minutes to the process. It’s so easy in fact, that I’m going to walk you through it step-by-step so you can have your own fancy pickled asparagus. 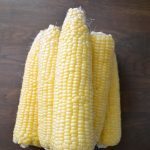 So this tutorial is split into two sections: the first section guides you through the pickling process and at the end of that you can refrigerate the jars or continue through the canning process. 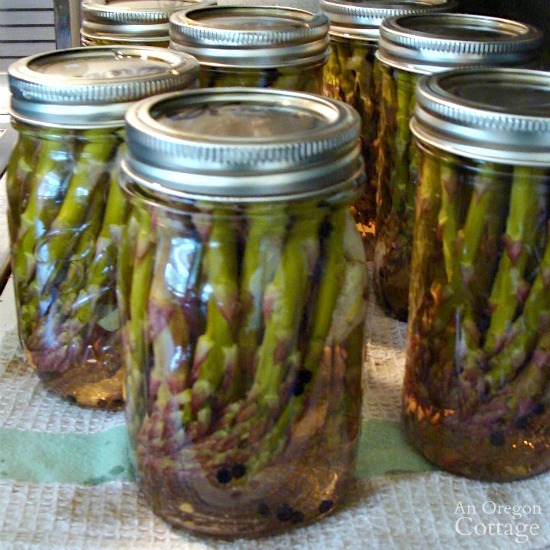 A canner load fits 7 jars and I use either regular pint jars and/or 12-oz quilted jars (I like the way the asparagus looks in the straight-sided 12-oz jars, though I can’t find them for sale anymore). Clean them well with soap and hot water (use a bottle brush or an old baby bottle brush from like I do). Keep the jars warm. The Ball Blue Book (great resource you should have if you want to can), illustrates putting the jars into the warm canner water to keep warm, but I find it’s too hard to get them in and out again quickly, so I just fill the jars with the hottest tap water and leave them in the sink. I refill them if they get too cool. I have a friend always puts hers in a 200 degree oven upside down on a towel-lined tray. 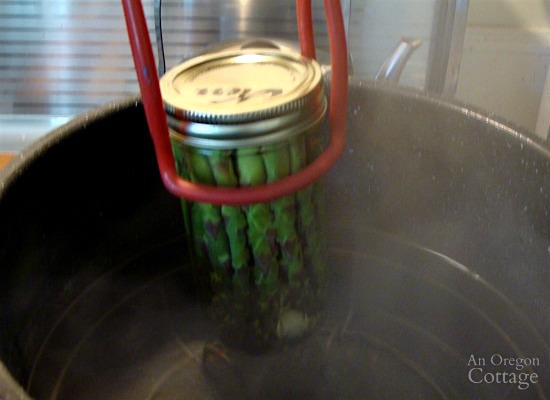 The point is to keep them warm until you need to fill them before canning. UNLESS you are not canning and just want to keep them in the fridge! Then just clean them. 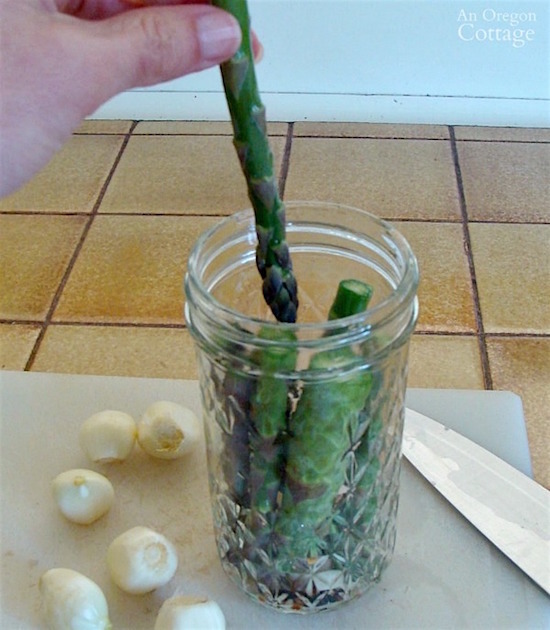 Put one spear in a jar and cut it to 1/2″ below the jar top, then use that as a measure for cutting the remainder of the asparagus. Tip: you can see in the picture that I like to make seven piles to represent the jars- it helps me visualize how many I need and when I’m close to having enough to fill the jars. Peel 7 cloves of garlic, and cut in half (to release more flavor). Measure 5 cups water and 5 cups vinegar (I use apple cider vinegar because it’s a bit more mild, some people like white wine vinegar, but regular white vinegar works, too) into a large non-reactive pot. Add 5 TB canning/pickling salt, and 4 TB. sugar. Stir well and bring to a slow boil. Drain one of the warming jars. 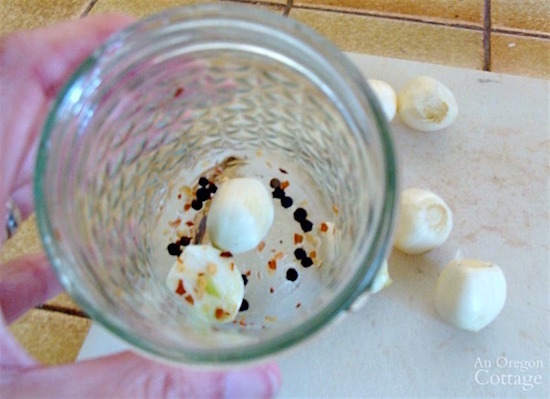 Place the garlic clove, a few peppercorns, and a few shakes of red pepper flakes in the bottom of the jar (the red pepper and peppercorns are optional – we like them with a bit of spice). Start packing the asparagus spears in the jar, pointed end down (although apparently there is some debate about this- some like their spears pointing up!). Squeeze in as many as you can without breaking them. I like to have all the jars filled before adding the hot brine, because the next steps need to be done quickly. I know it allows the jars to cool somewhat, but I’ve never had a problem when I fill them with the boiling liquid. If you’re worried about this, you can complete one jar at a time: drain, fill with vegetables, add liquid, attach lid, and set in canner (or set aside if refrigerating) before moving to the next jar. UPDATE as of 2015: You no longer have to let the lids sit in hot water for 3-5 minutes. Now you simply wash the lids before using. Always use brand new two-piece canning lids when canning, though, unless you are not canning, then you CAN reuse old clean lids. NOTE: if you plan to can these, now is the time to fill your canner 1/2 to 3/4 full with water and start heating to a boil. Fill the jars with brine. Use a non metal spatula (I love these flat plastic ones!) to go all around the jar to remove any air bubbles. Make sure the liquid is still 1/2″ from top (called the headspace), adding more if necessary. Wipe the rim of the jar with a damped cloth or paper towel. 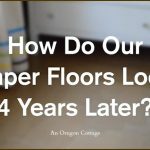 I’m using an old t-shirt cloth in the photo above. Place a lid on the jar. Here I’m using a fancy “lid lifter” which is just a magnet on the end of a wand. Note: with the new advice on not soaking the lids, the jar lifter is pretty much obsolete – just use your hands, though try not to touch the underside. Screw the ring on, tightening to just fingertip tight. Don’t wrench it, but make sure it’s secure. If you are storing the jars in the refrigerator, you are done! Just move the jar to the side and continue filling the remaining jars. Let them cool on the counter for a bit and place in the fridge. 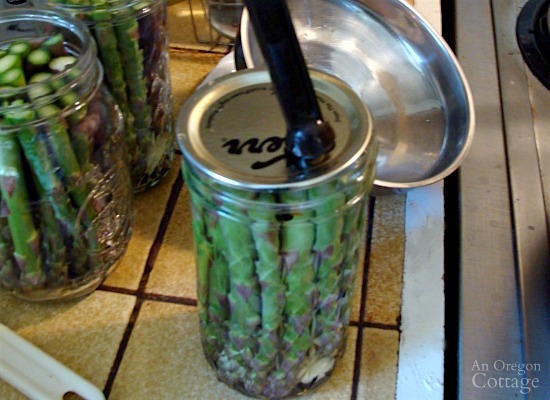 Add jars, one at a time, to water-bath canner. 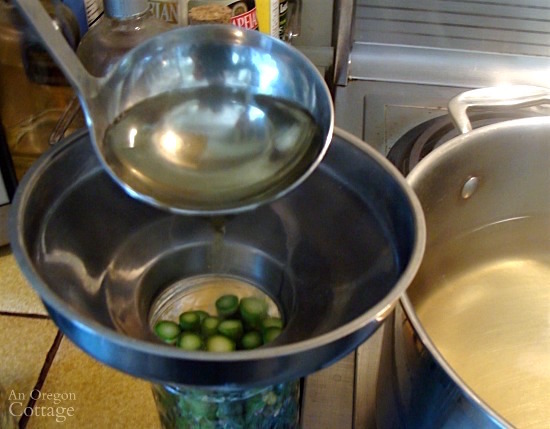 With water simmering in the water-bath canner, use a jar lifter to lower each jar onto the rack of the canner (the rack can be in the bottom like mine above, or sitting up top, which you’ll fill and the lower). A jar lifter is an essential tool, I’ve found, for canning- regular tongs do not work well and I broke a jar when I tried to use them. Continue filling each jar and placing in the canner until all are done. 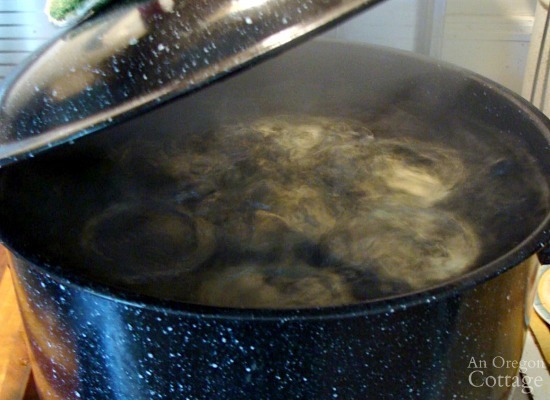 Bring the water to a boiling over high heat. Set a timer for 10 minutes and adjust the heat so the canner continues at a soft boil, like shown, which is medium to medium-high on my stove. Update: I’ve discovered stainless steel canners with clear glass lids, which makes monitoring the boil SO much easier. 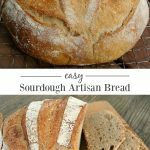 They are also safe for smooth top ranges- yay! When the timer goes off, turn off the burner and remove the lid. 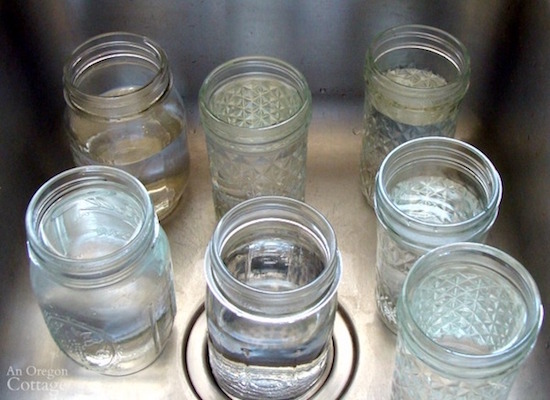 Place a towel on a surface where you will be able to leave the jars for 24 hours. 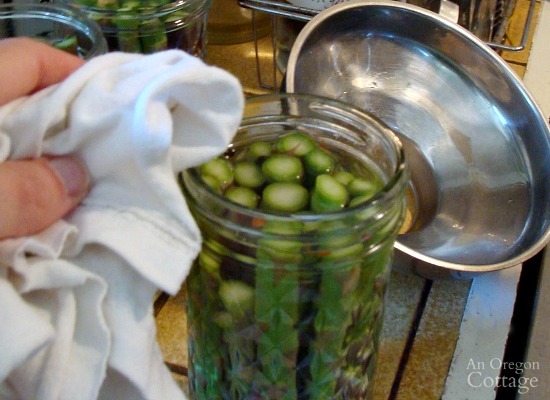 Use the jar lifter to remove each jar and set on the towel as gently as possible. Leave to sit, undisturbed, for 24 hours. Check seals: make sure all the lids have depressed in the center and then unscrew each ring and check the lids for proper seal by trying to lift off with your fingers. Lids that are properly sealed should not move or come off with that pressure. 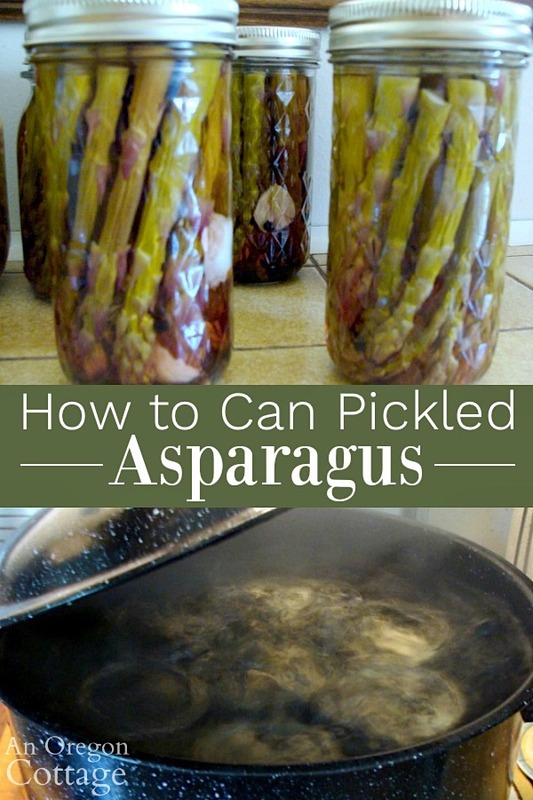 Click the arrow for more tips & the complete canning asparagus printable recipe! How long do you recommend they sit for the best flavor before eating? At least a month, Stephen. I have canned for decades (used to help my mom) and I really thought I had goofed when I checked the asparagus this morning and they were all shrivelled. Thank you for stating that I have not become a miserable failure after all these years. I took the cut off the chunks and put them in a separate jar and pickled them too, not knowing what to do with them. Now for an appetizer, I will try your suggestion of spears in a blanket. Case closed. BTW I use the pickled spear as a swizzle stick in a Caesar cocktail. YUM!! 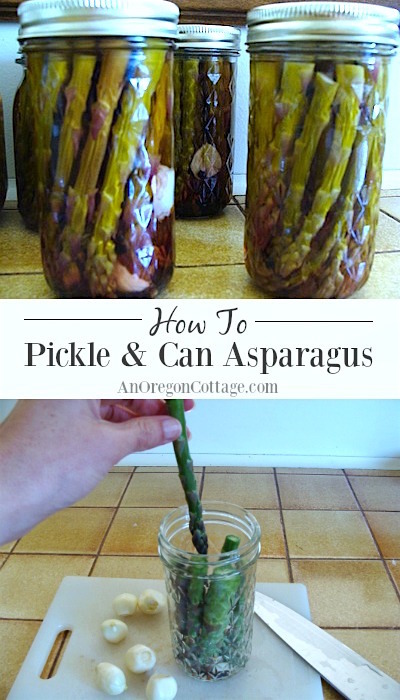 just wondering if you could tell me if I want to use a pressure canner for pickleing Asparagus how long would I cook it for??? 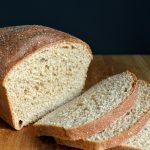 I did a lot of canning this year but didn’t get to try this recipe. Definitely going to save it for next year. Thanks for sharing! Will have to look into growing it…I know people do grow it around here. 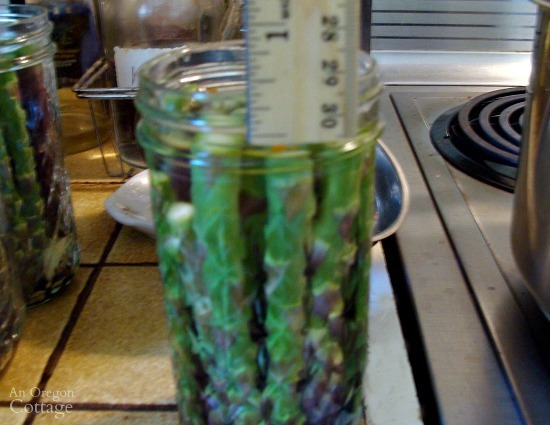 Thank you so much for the tip on why my asparagus looked so shriveled when I was done! I honestly thought the whole batch was ruined but I couldn’t figure out what I did wrong. Now that I know they will plump back up in a few weeks, I think my first attempt at pickled asparagus was a great success! I am trying this today, I only was able to do one quart but I was doing pickles so wanted to try it. My husband will love it. I canned some asparagus last night and they turned out small and shrivelled. Thank you for saying to wait a couple of weeks and they will look better- I will give it a try! What great photos. I hope you’ll consider linking up this incredible post over on Momtrends. Feel free to email me (address in About Me) with any questions. I also plan on posting about other things I can regularly like salsa, tomato products, roasted peppers, and sauces and chutneys. Look for these when these are ripe in the garden. Every year I say I want to try canning but never do. Thanks for this post. I will try it this year. 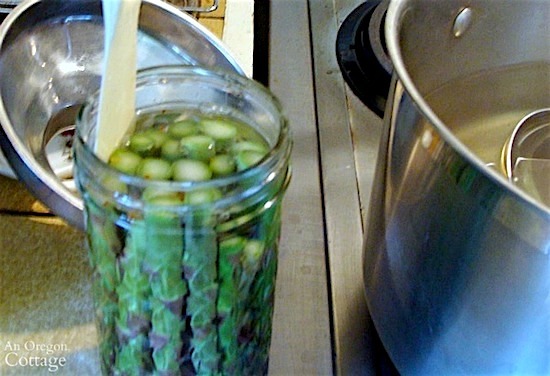 Thanks for posting the pictures and sharing you’re insight into pickling and canning asparagus. This is the first year I’ve planted anything (tomatoes & bell peppers) and plan to give canning a try. Perhaps I can hit you up for tips and techniques?